Why do we care about mode share, ctd. A while ago, I pretty much lost a debate in the comments with transit writer extraordinaire Alon Levy. At issue was whether mode share – the percentage of commuters who use transit, cars, biking, etc., to get to work – was the best way to measure the effectiveness of a city’s public transportation. The debate was provoked by yet another ranking of cities by transit mode share, and my discomfort with the triumphant reaction from some quarters. The argument in favor of mode share is basically that people will do whatever is easiest and most convenient; if very few people are using transit, that’s a pretty good indication that it isn’t easy or convenient for the vast majority of people. My counter-argument was that mode share measures relative ease and convenience: if 10% of people take public transit, that tells you that transit is more convenient than driving for roughly 10% of commuters, but it doesn’t tell you if, for the other 90%, transit service is perfectly acceptable, but driving is just easier; or if transit service is actually terrible. I think, though, that the new report on jobs accessibility from the University of Minnesota should reopen the debate for at least as long as it takes for Alon to convince me again that I’m wrong. 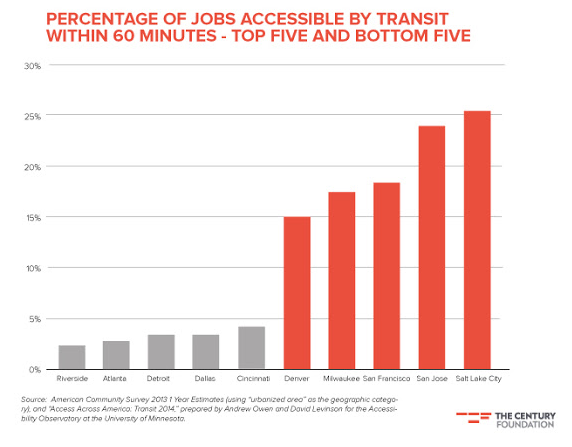 In particular, Jacob Anbinder’s interpretation of the study at Real Clear Politics, which looks at the percentage of regional jobs accessible by public transit within an hour (the original report focused on raw numbers). And, when you do that, it becomes clear that the massive, older regions with very high transit commute share – New York, Chicago, DC, etc. – have a problem: namely, that getting to jobs outside their dense cores is very, very difficult. At the same time, smaller regions with little to no reputation for public transit – Salt Lake City, Milwaukee, Denver – look much, much better. Transit access in Chicago: great in the center, not so much elsewhere. Click for interactive map. There are a number of things at work here, I think, which all boil down again to the fact that mode share measures relative convenience, not absolute. In the dense centers of America’s largest, older cities, transit is relatively convenient, and driving is relatively inconvenient for reasons of traffic, parking, etc. 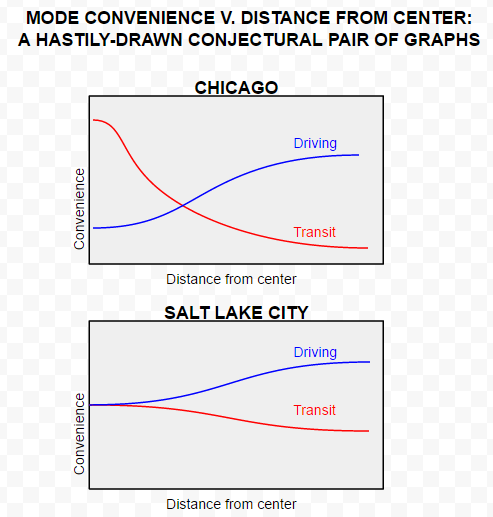 But as you leave the center, transit becomes dramatically less convenient – especially if you’re not going to the center, which is often served by commuter rail lines – and driving becomes dramatically more so. What that means is that for a relatively large number of people who live in the core, transit is the better option, leading to high mode shares; but outside the core, transit service isn’t just less convenient than driving, it’s actually pretty bad. In some smaller metropolitan areas, though, transit may be so-so over a much larger percentage of the region, while driving is basically always convenient. These cities lack the cores that give places like Boston a high mode share, but provide decent enough transit service over a large enough portion of the region that if you really want to use transit – because you want to save money, or you’re too old/young, or you just don’t like driving – it’s not a disaster. That’s how you arrive at the fact that the average commuter can get to 25% of jobs in metropolitan Salt Lake City within an hour, but only 15% of New York’s. Now, there are a number of caveats to this. In particular, using total commute time as a cutoff (jobs accessible in an hour) inherently disadvantages geographically large metropolitan areas like New York or Chicago. First, obviously, because the larger the area, the longer it takes to get places, all else equal. But also, as a region expands, the challenge of making any given point-to-point trip doable on transit requires much, much larger investments in infrastructure: while a smaller region might be able to get away with a well-organized bus system, and a medium-sized region with buses and a few radial rail or BRT lines, a region the size of Chicago or LA needs an extensive bus system, radial rail routes, and some kind of cross-town rapid transit service. More significantly, as a good leftist, I believe that inequality matters. It may be that in Salt Lake City, a 60 minute commute on public transit would take only 20 minutes by car, while in New York, a 60 minute transit commute would be 45 minutes by car. In a region where the expectation is that commutes will be relatively short, transit accessibility that requires dramatically longer trips will probably relegate transit to a sort of welfare service, patronized only by those who absolutely, absolutely have to. That kind of stigma is a problem for all sorts of reasons: to begin with, I’m against stigmatizing people; but also, from a political perspective, it probably makes it harder to lobby for improvements to public transit if it has the reputation as a service exclusively for poor people. Still, I think this report adds some strength to the idea that mode share is a very incomplete look at a region’s transit effectiveness. Also, happily, the widespread attention it’s received is a pushback against the kind of urbanist lifestyle fetishism that frequently accompanies rankings based on mode share. (See, for example, the story I quote at the beginning of my earlier post.) A functional transit system ought to be about making day-to-day life easier for regular people, and focusing on job access highlights that. Yay. I personally commute to my workplace on bike, but I don’t think that commuters via tram, bus, taxi, or car are hideously un-environmental. The key with environmental living is to be conscious and consistent with actions. If you can express your convictions more groundedly through biking or jogging to work, more power to ya! Yeah, I think the issue is less about environmental consciousness than making sure that people have reasonable options – no one’s going to take transit if it takes three times longer than driving. Thanks for reading! The report is also a great reminder that transit accessibility to jobs is mostly about land use and less so about the quality of transit service. Dispersed, suburban jobs are very, very difficult to serve well with transit in a way that will be convenient to anyone, yet alone to the critical mass of people that will make transit an attractive option relative to all others. Often, this kind of stuff is mentioned in the media and the criticism immediately falls on the transit agencies. The tendency is to think of the land use and the location of these jobs as something immutable, and that is not true. For that to happen in suburban areas, you really do need a rather remarkable concentration of jobs – essentially as a satellite downtown. I’m most familiar with my home in DC, where older centers like Silver Spring and Bethesda spring to mind, as well as newer ones now served with rapid transit like Tysons Corner. Ultimately, the land use solution to making these suburban locations work well with transit is to make them more urban in form, in terms of density, design, etc. It’s the difference between a polycentric area vs. a decentralized one. A polycentric suburban job pattern has promise for successful transit service; a completely decentralized and dispersed pattern has little hope for transit ever succeeeding – the game is rigged against it. Sure – I think that’s probably worth emphasizing. I do think of these reports as a transit/land use report, rather than just transit – or maybe better put, I (and you, and a lot of urbanists) have internalized that transit implies land use. Maybe it would be nice to see someone like the people at U of M put out something thoughtful, with catchy graphics, that emphasizes that point for the general public. Is it reasonable to expect a resident to access all the jobs in a large metro area? Salt Lake City would be a tiny piece of the NYC metro area or Chicago, if the whole metro is less than 10 miles wide, it’s easy to make everywhere somewhat accessible by transit. In a large metro, it isn’t practical to travel across the whole width daily by any mode. Rarely do suburban NYC residents commute to another suburban area (say Long Island to New Jersey) by any mode nor expect easy access. Ditto with NYC residents to the suburbs (except for outer city to adjacent suburb) in most cases; a large metro creates its own subdivisions. The Bay Area is separated into two metros, if they were joined, their rankings would drop by a lot. Still I agree it shows something, I’m just a bit skeptical. No, probably not, especially given the sheer physical size of our larger metro areas, and everything you just said. Anyway, that is the thing: what does it show? I don’t know that I can articulate it very well. Maybe the key is in the transit-car differential? I’d love to see someone do that; my technical skills aren’t nearly good enough. Your weighted averages (sheet 1, column O) look very strange. I didn’t make it, found it view the Human Transit blog. I think they weight the shorter commute times more. Oh, interesting. Can I make things from this? Trip time alone does not actually capture all the reasons why people might choose driving over transit. The transit trip is actually an interrupted walk and may require more than one vehicle/mode – so access time and wait time get valued differently. Variability and predictability of performance also matter. A bus service that is subject to traffic gets very unpredictable quite easily – added to all the other factors that add to bunching, missing buses, pass ups and so on. In places with really good frequent transit, overcrowding becomes an issue, which also affects whether the time on board is actually usable. Speed is often less significant than convenience. Absolute mode share may not be the best indicator – but it is the most useful to assess the performance. Transit agencies tend to compare themselves with each other on this indicator, but need to direct their attention to increasing mode over time. Unfortunately the values look small – tenths of a percentage point over years. So agencies like to talk about about big numbers like ridership, which actually can be quite misleading but resonate with politicians. These are all good points. Confused, though: what is the distinction between “best indicator” and “most useful to assess performance”? My first impression is that what Nei said about metro areas creating their own subdivisions is correct. Because rapid transit compresses travel distance along the lines, it causes people to choose where to live and work accordingly. I chose my apartment specifically because it’s within walking distance of my university; there were better deals elsewhere, which I would’ve taken if I’d worked in the CBD. For a hint that something like this is going on, compare the percentages of jobs accessible by transit in an hour with actual mode shares. New York’s transit mode share is 31%, and 60% of those transit users take less than an hour to get to work. That’s already more than the report says is accessible via transit – the report says only about 15% of metro area jobs are accessible by transit in an hour. But you should also add 12% commuters who use neither a car nor transit, of whom about half walked (and a third worked at home), and among those 12%, 90% take less than an hour to get to work. What happens in an idealized transit city is that the functions that benefit the most from size and agglomeration outbid everyone else for CBD space (where commute times are usually the worst, but there’s reasonable access from all directions), and then the uses that can live with the dispersal to sectors of the metro area get dispersed to specific sectors. Research universities are weird in that they agglomerate to scary extent, but usually stick to off-CBD campuses, leaving the CBD for FIRE, hotels, professional services firms, and business schools. CUNY wisely put the grad center next to the Empire State Building (while dispersing the colleges all over the city), but CUNY is enormous. Normal-size universities like Chicago and Northwestern are happy with locations that basically force you to live in a very small set of neighborhoods, unless you’re driving. Sure, that’s obviously a thing. On the other hand, I think it’s also a thing that there are large numbers of jobs – certainly in Chicago, and I would imagine in NYC and other “transit cities” – that are simply inaccessible by public transit. Or they’re accessible in a tiny, tiny, area, where housing prices are high enough to be a burden to/keep out moderate- to lower-income people. I don’t know, obviously, but it’s at least theoretically possible that there are cities with lower mode shares where a larger percentage of jobs are reasonably accessible from *somewhere*, even accounting for the metro area subdivision model.